West Palm Beach is the largest city in Palm Beach County, with a population of about 98,000. This urban metropolis is a popular vacation destination and ideal place to live thanks to tropical climates, nearby beaches, and a wide variety of attractions. With several city parks, public and private golf courses, museums, and annual festivals, there are activities for every lifestyle and interest. Beautiful, quiet beaches are found just moments away on the Island of Palm Beach, which is connected to West Palm by three bridges. Clematis Street, the heart of the downtown retail and entertainment district, offers an array of nightclubs, restaurants, and specialty shops. Nearby, the popular open-air shopping plaza City Place, which was designed to look like an Italian Piazza, has its own collection of eateries and boutiques. Entertainment-seekers have no shortage of options at City Place, which is home to a 20 screen movie theater, a comedy club, and the Harriet Himmel Theater for Cultural and Performing Arts. The larger performing arts center in town, the Kravis Center, is located just across the street and offers world-class theater, dance, and music shows. 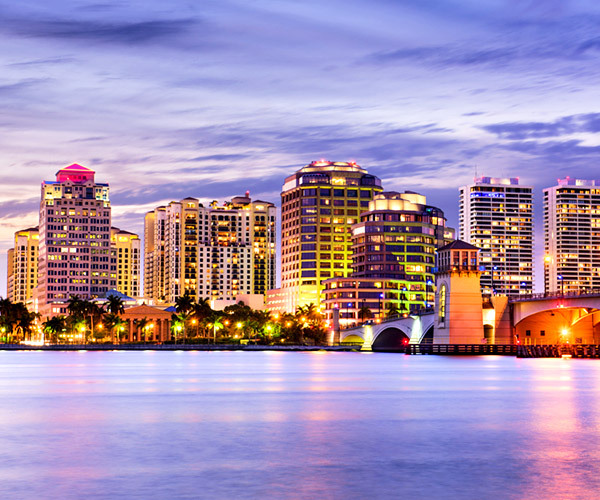 West Palm Beach offers a variety of residential housing styles in every price range, including urban downtown apartments, high-rise waterfront condos, gated communities, and historic "Old Florida" neighborhoods.